Greet the New Year by cruising on Lac Léman from Geneva, Lausanne, Vevey, or Montreux from December 31 to January 1. Revelers can welcome the New Year in style by cruising on CGN Lake Geneva passenger boats with special Sylvester dinners, champagne, and music. Special New Year’s Eve cruises depart on Lac Léman from Geneva, Lausanne, Vevey-Marché, Montreux, and Le Bouveret on December 31 and return to the same ports after midnight on January 1. These Sylvester cruises include gourmet dinners, music and champagne at midnight. Reservations are essential. 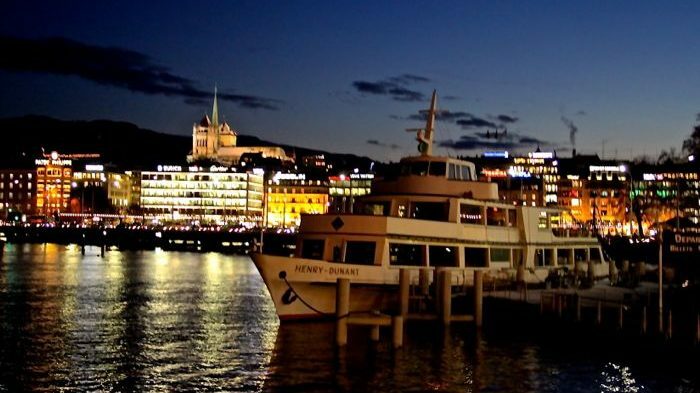 CGN has three special New Year’s Eve cruises on Lac Léman in Switzerland to welcome the New Year with gourmet dinners, champagne and dancing. Boats depart from Geneva as well as from Lausanne and Haut Lac cities (Vevey, Montreux, and Le Bouveret) with the latter two cruises viewing the midnight fireworks of Vevey. Geneva – depart Genève-Mt Blanc at 8 pm and return 1:30 am. Lausanne – depart Lausanne-Ouchy at 8 pm and return 1:30 am. Haute Lac – depart Vevey 7:45 pm (return 1 am), Montreux 8:15 pm (return 1:25 am), and Le Bouveret 8:45 pm (return 1:50 am). No boats depart or call in France – revelers from Evian should drive to Le Bouveret or cross Lake Geneva to Lausanne by passenger ferry (although there won’t be any ferry back until much later in the morning). The special CGN dinner cruises are accompanied by music and champagne at midnight. Gourmet six-course meals are served on these Lake Geneva Sylvester cruises. The meal is included in the cruise price, as is a variety of wines during the meal, a mineral water, coffee, and a glass of champagne at midnight. Further drinks are available from the cash bar. The cruise fare for the midnight dinner and music cruises are CHF249 for adults, CHF179 for children 13 to 16, and CHF199 for children 6 to 12. Advance reservations are essential through CGN’s website or infoline. (+41 848 811 848). The lake boats departing from the Haut Lac and Lausanne will be off Vevey at midnight to see the firework display. Passengers on the boat from Geneva will observe that the Swiss generally welcome the arrival of the New Year without much noise. Other than the midnight dinner cruises on New Year’s Eve, cruising on Lake Geneva is very limited during the winter season. The best bet is often the ferryboats between Lausanne and Evian or Thonon, or from Nyon to Yvoire or Chens-sur-Léman – these passenger ferries operate year round.